Minimus Maximus | Nicole, Deipnosophist. We’d been feeding a little stray cat for a few weeks. He was painfully scrawny and had nearly identical markings to Mr. Kitty. I had said, no WAY, no more animals. Carlton’s big heart saw room for one more. Thus Mini came into our lives. We took him to the vet and discovered he had FIV, a death sentence. Also, if he bit our other cat, they would both be infected. So they had to be separated. We named him Mini because he looked so similar to Mr. Kitty. Mr. Kitty’s real name is Baja, so this guy was named mini-Baja, the name of Carlton’s annual college project. Mini was a little version of Mr. Kitty in looks but not demeanor. Mini was spunky. I don’t know if it was genetics or his need to fight for survival but it was alwas part of him. In fact, one of Carlton’s first memories of Mini-Baja was of rescuing him from the bushes and being bitten. Mini bit me enough to draw blood, with no provocation. He was confused and never knew how to give love. I was pregnant and fearful that his bite would transfer some infection to the baby. He lived in our bathroom-bedroom-closet suite for a long time. We moved him downstairs to the windowless backroom after he’d bitten me too many times. We would cuddle him twice a day. We’d let him out on weekends, unless we had a houseguest who was afraid of being bitten. I tried to let him be on the back porch but he was so emotionally riled by the end of the day, wanting to attack birds, that he couldn’t handle the stress. I don’t want to say it…I love animals…but I wished he were gone more than once. When he was happy, he’d trip me; when he didn’t want me to leave, he’d bite me. I didn’t know how to love him and make him feel loved. Mr. Kitty’s health is bad and he’s 10 years older than Mini. I had this sad but happy vision of the day that Mr. Kitty dies, when Mini gets to have his run of the whole house, no worries of infecting another cat with FIV. He would run free and happy in my vision, and never bite anyone out of confusion or frustration again. Monday he was scampering around the family room, chasing a little fake mouse and batting it around. Tuesday he was moving slowly. Wednesday he was very slow. 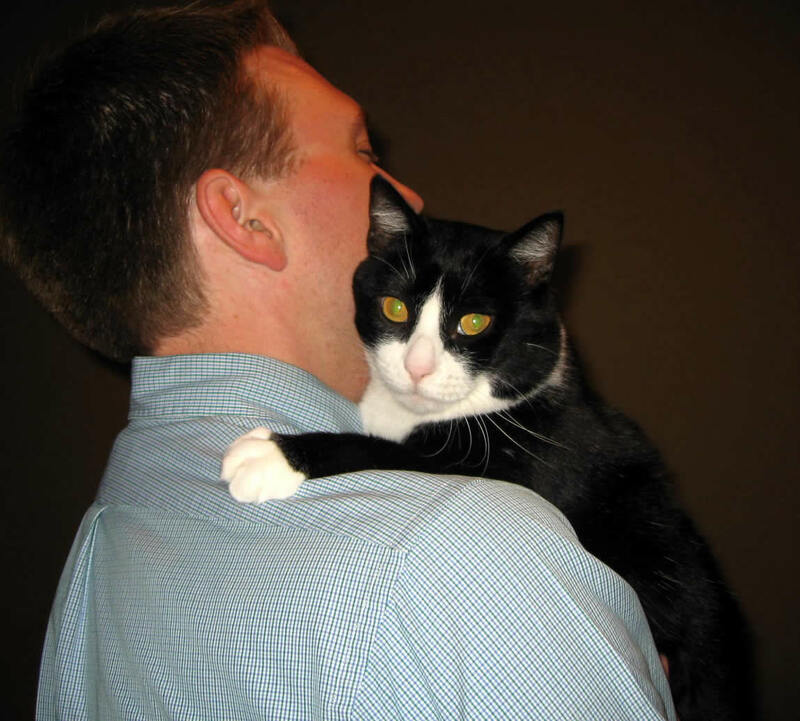 Carlton and I held him in our arms and petted him- he never wanted to be held so we knew he needed love. I scratched his ears. Tonight he was dead. Was Mini ever happy? Some cruel person(s) left him outside with no care if he lived or died, and we took him in. He had to be locked away from Mr. Kitty so he never had freedom. He was even named Mini, the smaller name of the “main” cat. I felt like he spent his whole life waiting to be fully loved. We loved him and we did the best we could. I love you, Minimus Maximus. I just don’t know what to say !! But I am sure Mini felt loved and taken care of with you all !! And now suddenly I realize that I never said good-bye to Mini when I left………. I’m so sorry about Mini. This is the third pet death I’ve heard about this week and it never gets easier. Mini lived life to fullest. He ate everything in site, played enthusiastically, and was surprisingly sweet when he wanted to be. I think he was Roman at heart, and thus his name. If over-fed (by getting into his food container), he would eat so much that he would throw-up, and then start over again. And again. He was so energetic earlier this week, like a kitten, when chasing Ainsley’s toy. I’m glad we got to say goodbye to him, I just wish we knew that was what we were doing. Apparently with FIV, the slightest sickness can progress into something more very quickly. Oh, poor Mini! You’ve had a lot of stress in your pets’ health lately but I didn’t think FIV would crash him so fast… he seemed like he’d go on forever. I know you know all of it, but I’m saying it again. Had he been left outside, he would have died long ago. Had you taken him to a shelter, he would have been euthanized. He knew a real home thanks to your accommodations–a real home is any where you are loved and accepted for your quirks, even ones that others wouldn’t have tolerated! I know it was hard for you guys to deal with him sometimes but a cat with a palace for a home like yours is even better than if he’d been in a formal rescue, locked in a cage all day. I’m glad you made him part of your family! I hadn’t seen him in awhile, but he never bit me when I fed him and he was always happy for the attention and food. That’s a cat who likes life. Thanks everyone for the kind words. Amy, I thought he’d go on forever too. We questioned if we should have taken him to the vet, but we honestly didn’t think he was that sick- just seemed like he wanted to have some comfort. I hope his soul is in ancient Rome, wearing a toga and eating splendidly. Just remember that you gave him shelter, food and love. It would have been so easy to rationalize taking him to a shelter, but you gave him a home. Aeternum vale Minimus, feles romanus! Amicitiae nostrae memoriam spero sempiternam fore.